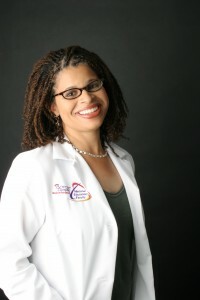 Dr. Jackson is a mom of 3½-year-old twin girls and a 14-month-old son and a dermatologist and medical director of the Skin Wellness Center of Chicago. How many children do you have? I have 3½-year-old twin girls and a 14-month-old son. What’s your specialty? I specialize in skin cancer surgery. I’m a Mohs surgeon, and I also do a lot of cosmetic work, including laser and Botox. It’s a full-service practice. What’s your favorite parenting tip? Life is like a lazy Susan. With that I mean there’s so much of parenting that’s out of your control. You have to let go of any obsessive-compulsive tendencies you might have. What has surprised you most about parenting? It’s not for wimps. But it is rewarding. When my children run up to me and give me spontaneous hug and tell me they love me, it’s priceless. How do you get your kids to eat healthy food? The Magic Bullet is my favorite thing because it can puree anything! How do you recharge your batteries? I’m not a morning person by nature, but I’m learning to become one. My time is from around 5 am to 6:30, when my kids get up. Also, Saturday mornings are my running training times because I need to run with a group, and that’s when they run. My husband prefers to run by himself, so he does his long runs on Sunday mornings. Also, this might not sound like “me” time, but one night each week my husband stays late at work to catch up, and another night each week, I do. This is helpful to get caught up with paperwork, phone calls, and emails, which is really stress relieving. My baby isn’t a good sleeper. How did you make it through this time of sleep deprivation? Our baby is now six months old and still not sleeping. I’m considering sleep training her. Did you sleep train your babies?